Matthew Elliott and Lee Rotherham, joint authors of The Bumper Book of Government Waste, have performed a great service to the nation in highlighting some of the many inane and stupid spending decisions of recent times. Not the least of its merits, 10p from every copy sold goes to 'Is It Fair', the anti-council tax campaign group. I shan’t repeat all the examples they give, and which run to a staggering £82.4 billion of waste. If you simply want to spend an evening in, having a laugh at the ineptness of the Blair Reich, you will not be disappointed. There’s something here for everyone: John Prescott’s forays into fire-fighting; why DfID isn’t winning (or indeed fighting) the war on poverty; and of course the EU’s experiments in sauna etiquette. In passing the authors take a swipe at the James Report for failing to reach a total anywhere close to theirs. Political cowardice is hinted. I’d like to take some time to cover the issue, because it actually goes to the heart of what The Bumper Book is all about. It isn’t really fair to compare directly the James Report and The Bumper Book of Government Waste. To explain why, we need to understand that there are actually different types of “waste”. Policy waste: caused by Government undertaking certain activities for which it is unsuited or (more accurately) which you believe it should not be doing. For example, running a mass-production car industry – or, if you prefer, invading Iraq. This is an area for political dispute, and that is why we have General Elections. Structural waste: caused by the administrative structure itself being inherently wasteful. For example, university tuition fees where, in order to charge higher fees to students, universities have to apply to a quango and prove that they are not discriminating against disadvantaged pupils. Irrespective of the merits of the policy, it must incur costs which mean the full amount of the higher fees is not recovered. This waste is recurring because it arises out of the very nature of the governmental machinery. The solution is to redesign the administration (assuming you want to keep it going). Executive waste: caused by somebody making a bad decision, either through poor management judgment and a lack of relevant skills or the absence of critical information (what public enquiries usually call “bad luck”). For example, Sir Humphrey puts his money on red and the roulette wheel comes up black. This may or may not be recurring; it will depend on whether and where Sir Humphrey is posted next. The solution to this may be as simple as replacing Sir Humphrey and ensuring that the next chap in charge has a better idea of his job, which could involve higher training costs or a redundancy settlement for Sir Humphrey. At some point, however, questions will arise as to whether Government is best placed to be taking certain executive decisions. A good example here would be the negotiation of PFI contracts or any form of procurement arrangement. Exceptional waste: any of the above, but where the incident is of a genuinely one-off nature. For example, the Millennium Dome. However horrific the final cost of that project was, nobody is ever going to build another Millennium Dome. It is possible to cut down on exceptional waste by measures which minimise exposure to policy, structural and executive waste – but once it has been wasted, the money has gone forever. Such waste cannot be cut once it has happened. It is not possible to un-spend the amount wasted on the Dome. Elliott & Rotherham would say that it is in the nature of Government that it seems to have recurring exceptional waste. They are right. 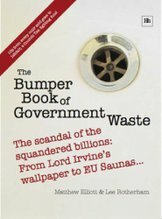 But The Bumper Book of Government Waste is mainly a catalogue of historic waste, of things which happened during 2005/6. It is not a plan for waste-free Government. I’m sure they are correct to say, for example, that of the £12 billion spent on incapacity benefit at least £4 billion is wasted due to fraud – but that’s the easy part. Unfortunately, it is actually easier to save £12 billion, by abolishing incapacity benefit outright, than it is to weed out the £4 billion of fraud. Some commentators on the left, if pushed, might argue that £4 billion in fraud was an acceptable price to pay for insuring that genuinely disabled people received the £8 billion. That becomes a political judgment; and Elliott & Rotherham were spared the joys of reporting to a Shadow Cabinet on the eve of an election. To compare The Bumper Book with the James Report is to mistake the difference between accountancy (which looks back to a completed financial year) and management accounting (which looks forward as a strategic planning tool). The James Report identified £35 billion of waste which we had worked out how to stop. Economists took decades to accept the idea of a “natural rate of unemployment”, that it is not possible to have total employment without unacceptable inflation. We have to face the unpleasant possibility that all organisations will have a natural operating level of waste. Someone will always push the wrong number into the photocopier. Employees will always borrow pens from the stationery cupboard. And at what point does chatting around the coffee machine cease being useful for team-building and morale-boosting and become bone-idleness and time-wasting? Government is an organisation which spends over £500 billion and which is not subject to the discipline of having to make a profit. Of course it is going to waste shedloads of money with access to that much cash on those terms. Elliott & Rotherham are saying that Government is inherently wasteful, and that the Blair regime has wasted about 15p of every £1 it has spent. True. Some of this waste can be attributable to policy and structural causes, and so it can be eliminated. But some of it will be executive and exceptional, and that can only be minimised. Nevertheless, The Bumper Book performs an invaluable exercise in simply cataloguing the extent of bureaucratic stupidity over money. It’s also an entertaining read. I look forward to the 2007 edition. Perhaps, once the message is repeated often enough, and with the flair these authors demonstrate, the message will start to sink in. Any one who is serious about modern politics should read this book. An excellent review. It should also be noted that the more insane examples of waste don't actually add up to that much (I can't recall the exact figure - the book is upstairs and I'm too lazy to get it). What we need to look at is the other examples of waste. Regarding the stupid examples of waste, it might be possible for the government to cut down on it by laying down certain guidelines such as banning hospitals from spending money on pointless artwork (I think 30,000 was spent by a hospital on some statue). I agreed. It is great, even the cheeky letter to dictators around the world. Just go an buy a copy. ..terrible typos -sorry - still drinking first coffee of day. I visited a very interesting site, they have a vast collection of books which have been categories and are presented to viewers in an easy-to-search format. You should check it out.